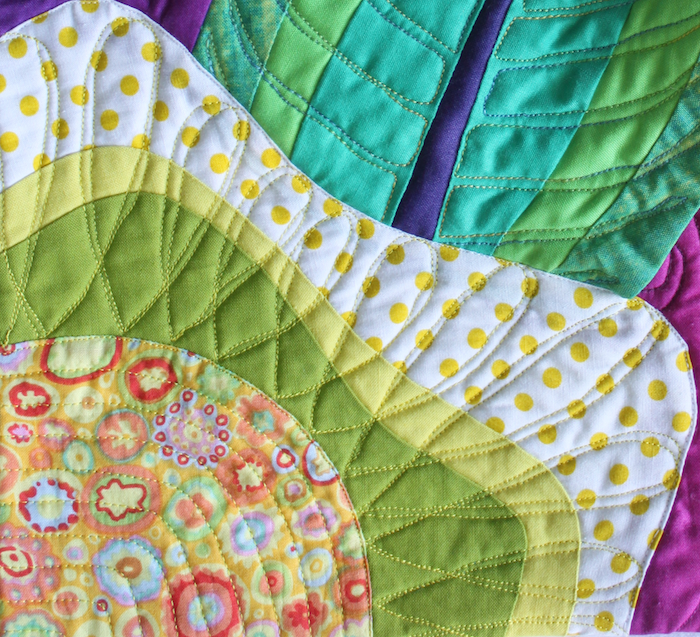 The Canadian Quilter’s Association has asked award winning quilters to donate a small quilted piece to their themed show: “It’s Time for Colour“. 40 pieces will travel across Canada and be displayed in local venues from January 2015 to May 2015, ending in Lethbridge, Alberta for Quilt Canada in June 2015. Everyone will have the opportunity to purchase these beautiful 12” x 16” quilt hangings for $200.00 each (plus tax). The proceeds will be donated to the Children’s Wish Foundation. You can sign up at the CQA blog to get more information and view some of the other pieces that will be included in this show. 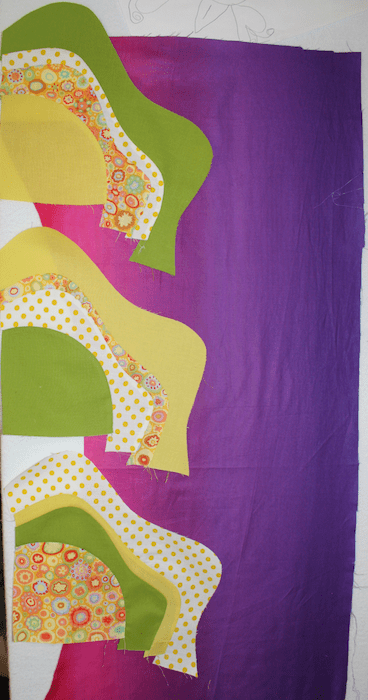 The quilters who are participating will be blogging about their inspiration and techniques for their submissions. My piece, Chrysalis Awakening is improvisationally pieced using a “wonky curves” method. My first step was to select some fabrics. I pulled the small print (Kaffe Fassette, I think) and then fabrics to pick up on the colours of the print. I knew I wanted to create a flower and a leaf. I taught a tutorial at the Toronto Modern Quilt Guild on piecing circles. One of the techniques I demonstrated was piecing ‘wonky circles’. I really enjoyed making the samples and thought I could use this technique to create a colourful flower for my design. 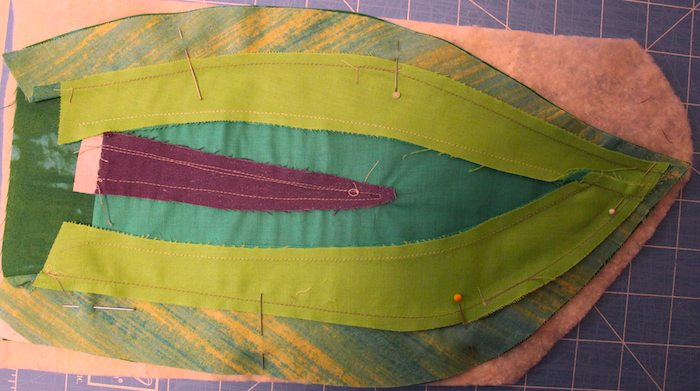 In this process you layer 4 fabrics right side up with edges aligned. A quarter circle is cut out of one corner of the stack. 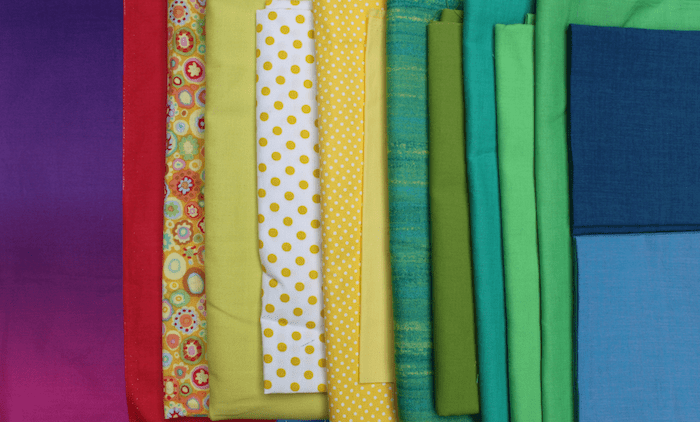 The fabrics are shuffled and stitched. You continue in this manner until the four blocks are completed. 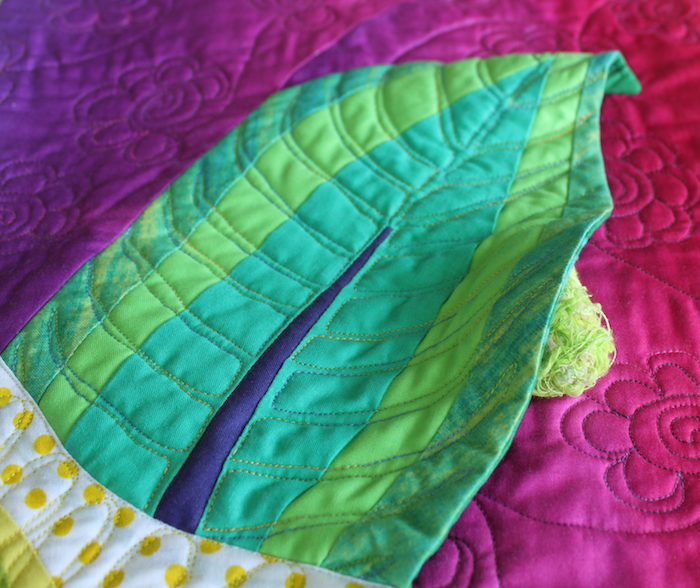 I originally saw this technique on The Quilting Edge Blog written by a very talented quilter Marianne. She has a great Wonky Curves tutorial that explains the process. For this quilt, I made the shapes very curvy to look like a flower. 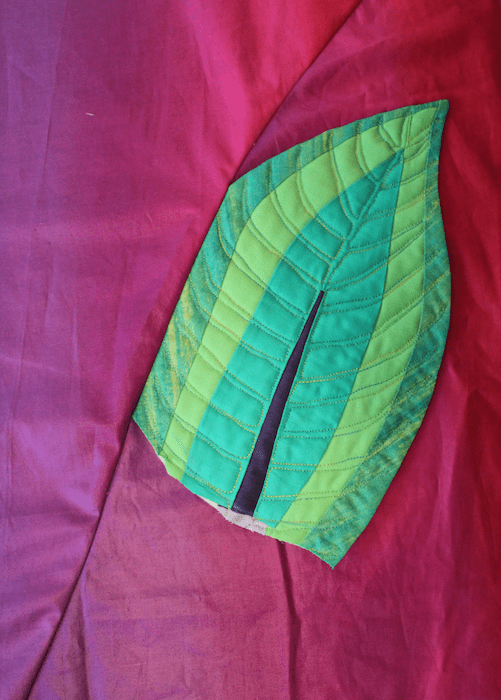 Every flower needs a leaf, so a selection of green fabrics were pieced to create the leaf. 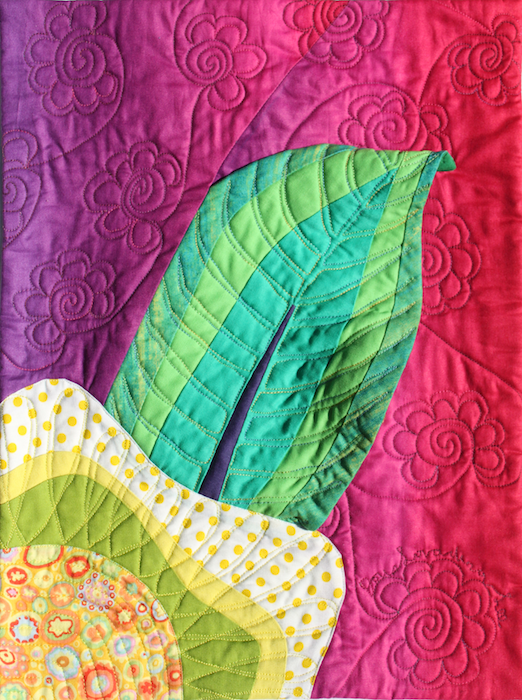 I layered batting, backing and machine quilted it to create a three-dimensional leaf. The completed leaf was inserted into a beautiful piece of cotton ombre. The colours of the fabric change from red to purple. The flower was appliquéd to the background. A surprise is hidden underneath the leaf. I love that there is a little surprise hiding behind the leaf. There are three flowers left and three other stages in the life cycle of a butterfly. 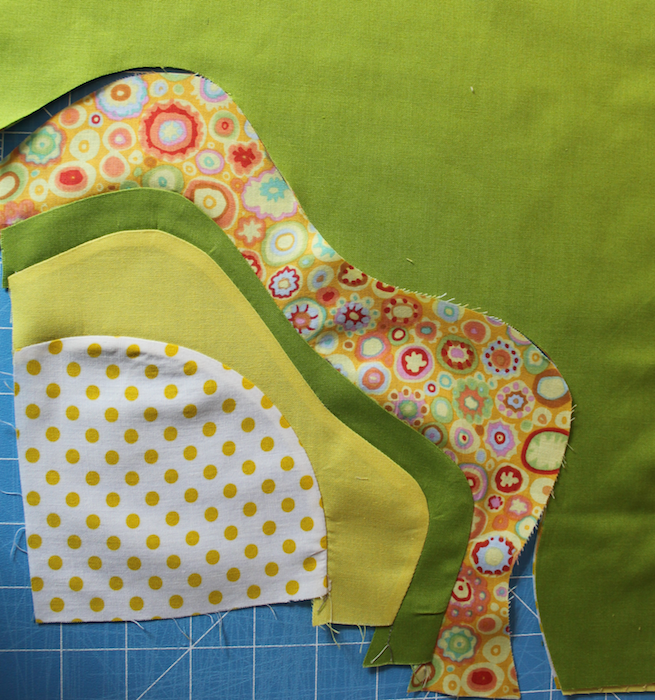 I am going to have fun creating three more quilts to illustrate the other stages – look for the surprises! what a wonderful piece! I’m looking forward to discovering the surprise when I see the quilt in person.